A kitchen remodel is one of the best home improvement projects you can undertake. It’s a great way to transform the look and feel of any home, and it also offers an excellent return on your investment. And that’s exactly why I wanted to give my kitchen a stylish upgrade with the latest home design trends. Unfortunately, I quickly discovered that kitchen remodels are also one of the most expensive home improvement projects. But that doesn’t mean I couldn’t get great results while working on a budget – and you can achieve the same. I learned that with creative thinking, you can save big on a brand-new kitchen. If you’re looking for ways to breathe new life into your kitchen without breaking the bank, here’s how I saved thousands when remodeling my kitchen. The most important step in a remodel is hiring a contractor. I thought I’d be able to tackle a kitchen remodel on my own – after all, contractors charge fees and add to your total cost. Yet a remodel is a lot more complicated than I anticipated. From finding cabinets and fixtures to coordinating different pieces of the remodel to ensuring renovations are up to city code, I was immediately overwhelmed. And after a disastrous start that involved lost tile that had already been paid for, I knew I needed help. And when I hired an experienced contractor who lived in my city, the entire project became easier. Contractors know all kinds of insider tips and information I didn’t – a factor that can save tons of money during any remodel. For example, my contractor recommended shopping for materials at local hardware or kitchen stores rather than big box stores like Lowe’s or Home Depot. My contractor knew that prices would be lower beyond the big box retailers. My contractor also offered cost-cutting advice on ways to achieve the look I wanted for less. I wanted brand-new kitchen cabinets in a dark wood; my contractor let me know that the cabinets I had my eye on would increase my costs by thousands, not hundreds, of dollars. He recommended we paint my current cabinets instead. That single change cut my cost of “new” cabinets to less than $50! In addition to offering money-saving advice and taking control of such a difficult process, my contractor also showed me how bargain shopping could help me achieve the kitchen design of my dreams for less. When I tried to manage my remodel on my own, I spent hours pricing brand new materials. I shopped only at the stores I knew – local hardware stores, tile and granite specialty shops, and custom cabinet makers. I wanted only the best, but I was quickly blowing through my budget. But my contractor knew how to get the same quality materials for far less. He recommended shopping for bargains in new places like Habitat for Humanity ReStores, which often stocks like-new products at a steep discount. My contractor even offered up materials he’d purchased for other jobs. The brand-new materials were even better than what I’d found myself, and I paid only a fraction of the cost. Many contractors are willing to share their deals with you and offer up unused materials, which is a huge help for your budget. Another area where my contractor was a huge help? Recommending cheaper alternatives to remodel aspects I thought I couldn’t cut costs on. When I hired my contractor, I let him know I wanted to make my remodel as affordable as possible without sacrificing quality. So, he helped suggest ways to incorporate stylish trends while saving money. He suggested open shelving as an alternative to cabinets, which cuts down on both installation costs and materials. Swapping out just two cabinets for this option was affordable and it added visual intrigue to my space. My contractor also recommended installing track lighting instead of recessed lighting. This saved us from having to rip into the ceiling – another expense – and achieved the exact same look I wanted with more affordable options to choose from. To refresh my lower kitchen cabinets, after painting them my contractor suggested choosing more modern drawer pulls and handles. These upgrades cost just a few dollars, but they changed the entire look and feel of the kitchen. 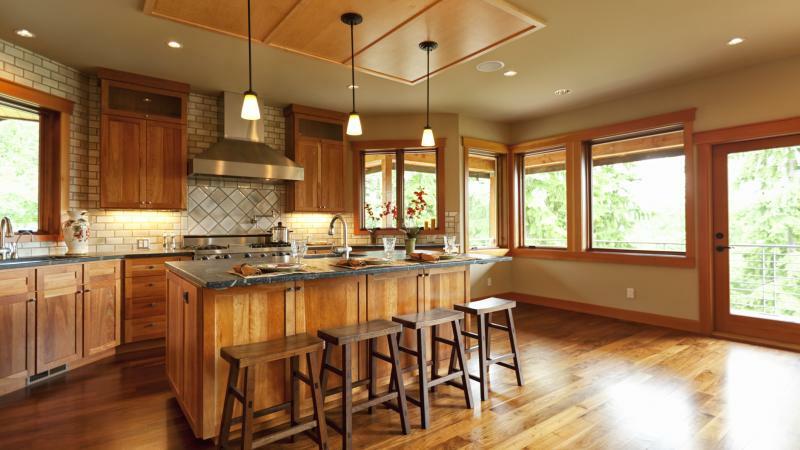 Ultimately, there’s no reason to try to manage and orchestrate your entire kitchen remodel on your own. I learned this the hard way. However, once I found the right contractor and enlisted his help to complete my remodel, I saved myself stress, many headaches, and a whole lot of money. To ensure you’re getting the best possible deals on materials and other costs, consider enlisting a local contractor’s help for your own kitchen remodel. Local contractors have relationships with suppliers that give them access to better prices than the general public, and their experience could save you thousands of dollars in the end. And, of course, the savings and peace of mind that come with knowing the job is done right the first time are well worth it. And a contractor doesn’t have to be expensive. So many homeowners try to handle remodels on their own because they worry a contractor will only increase their costs. However, with a little research, you can find a contractor who meets your remodel’s needs and your budget. And you may end up saving even more than you expected.